Gross Area: 181,000 sq. ft.
Area Per Student: 258 sq. ft.
Jordan Middle School was constructed in 1964. A major addition doubled the building’s size in 1969; however the school’s interior components, including classrooms and instructional areas, remained in their original condition. Year after year for nearly half a century students filled the halls and classrooms of a facility that was rapidly aging before the community’s eyes. Its core could not support the demands of 21st Century learners. The classrooms and their configuration were limiting the ability to support current educational needs and would be insufficient to deliver the Science, Technology, Engineering, Arts, Mathematics (STEAM) program that the District sought to provide. Mechanical and electrical systems had outlived their useful lives and were in need of replacement. Improving the building’s energy efficiency would necessitate replacing insulation, installing new windows and doors, and tightening the building’s envelope. DLR Group’s design team initially discerned that the building was structurally sound. However, in order to meet the needs of today’s students, the facility needed a complete overhaul. Planning for the Middle School began in 2009 with a re-assessment of all District facilities. 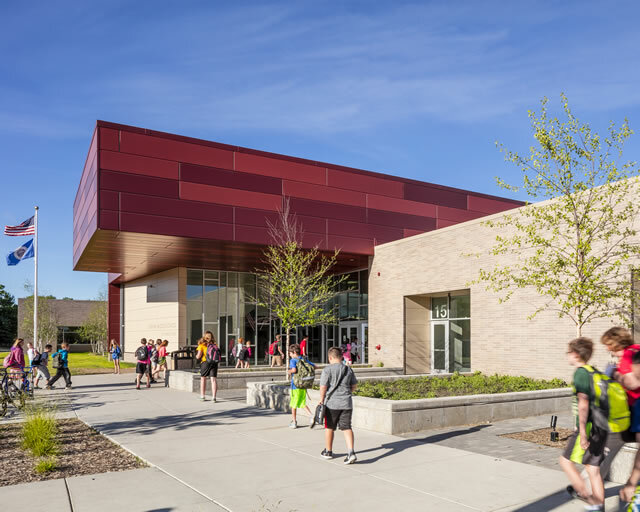 Throughout the process, DLR Group worked with a community-based design team to assess several options addressing the Middle School facility challenges. Discussions quickly centered on whether to renovation the existing building or construct a new Middle School on existing property. In the end, the District and community chose to honor the existing community asset and to maintain the district’s campus feel by keeping the middle school program in its original building. After opting to save the school, committee members turned their attention to the educational components of the building. After a successful referendum in March of 2014, two different groups contributed to the project design: community members and District staff. The community-based group formed during pre-referendum communication and support efforts continued as advisors to DLR Group’s design team. This group, joined by a committee of staff representatives, met throughout the six-month design process. 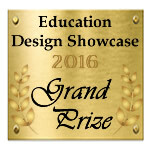 Their initial work focused on tours of other area Middle Schools and evaluation of future middle grade education programs. Three conceptual options were developed and prioritized before seeking approval from the Jordan School Board in May of 2014. All decisions were based on the District’s vision for a student-focused educational experience. “Our vision for a new Middle School program was eagerly accepted by families throughout the district, many of whom are professionals who expect the integration of technology and a wide range of course options,” said Superintendent Matt Helgerson. 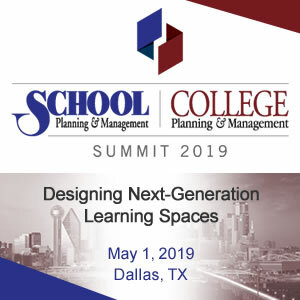 Together, the District and DLR Group created a plan encompassing strategic additions and renovations to maximize the usability of the existing building, while creating a wide array of flexible NextGen learning spaces. 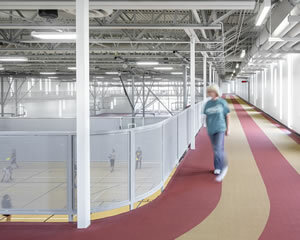 The Jordan Middle School design provides a balance of space types, between open and closed, large and small, with permanent and flexible wall configurations. The building allows for a variety of student-teacher ratios, supporting inquiry-based lessons, making and creating, and collaborative activities. Renovations totaling 75,000 SF create flexible and reconfigurable spaces for Jordan students and staff. Two academic pods house students in grades 5/6 and 7/8 and provide space for experiential learning. Each pod includes seminar rooms, labs, small group spaces, and teacher support areas. Staff and students determine how spaces are used throughout the day, and throughout the week, to accommodate particular lesson plans. Teachers are not assigned to a specific room. Rather, they work with their colleagues to determine an allotment of rooms that best support the instruction model and tasks at hand. The overall space allocation and room configuration can be changed over time in response to increased enrollment or redesigned curriculum. A 13,500 SF addition provides classrooms, labs, flexible learning areas and support spaces to the academic pods. The new configuration also creates a new public entry with improved security and direct sight lines from the administrative suite. A creative adaptation of the building’s core, using existing structural columns and raising the roof an additional 15 feet, houses an expanded mechanical system and brings natural light deep into the central commons area through a series of clerestory windows. The building’s energy efficiency and thermal comfort were enhanced by a new roof and tightened building envelope. 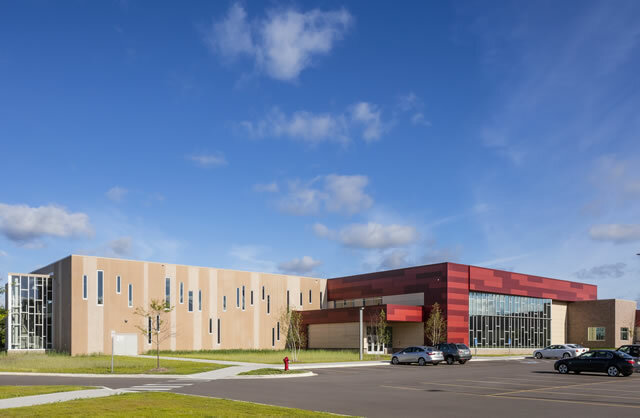 The school’s exterior skin and insulation were replaced, including an exchange of all leaky and deteriorated windows and doors for new energy-efficient openings. Both mechanical and electrical systems were updated, along with expanded phone, data, and CCTV systems. Within each pod is an integrated Maker Space, a designated space for hands-on learning. 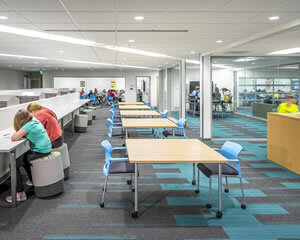 Each Maker Space contains a small lecture space, small-group room, collaborative computer lab, science lab, and hands-on project room with movable tables all divided by glass partitions with layered transparency. These spaces are reserved by staff and are accessible to all disciplines. The high degree of internal flexibility can be easily manipulated by staff in a few minutes by moving walls or furniture. This flexibility to change configurations allows for more self-directed learning by each student. 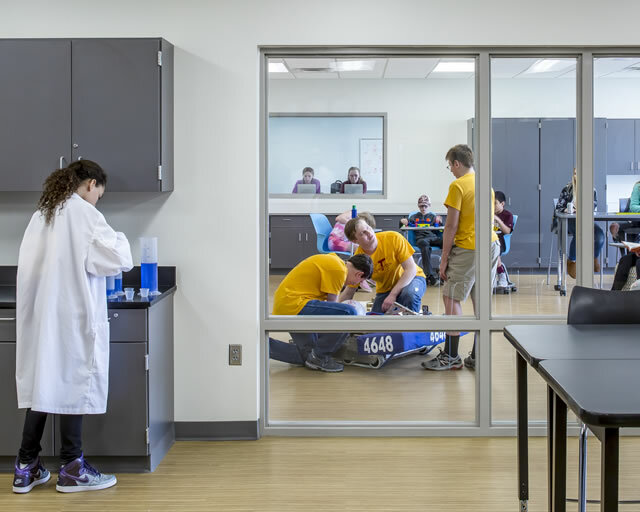 In addition to the academic pods, the renovated middle school supports a number of specialty programs for focused learning in performing, industrial, and visual arts. An Industrial Technology area available to both middle school and high school students throughout the day. The music suite provides rehearsal and practice rooms for both instrumental and vocal groups. 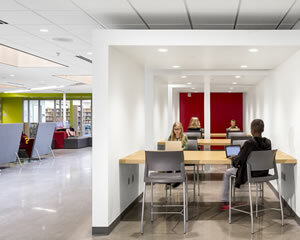 This space, separated acoustically from the academic pods, is located adjacent to the new gymnasium and community center addition to facilitate public music performance events. The centrally-located commons is where social learning happens. 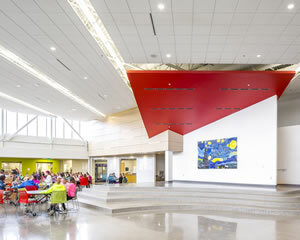 It serves as the primary community gathering area where students eat lunch, and can be used throughout the school day including an ad hoc “mountain top” teaching environment, or a formal performance area. Additionally, high table nooks built into the perimeter are available to both students in small-group work or teachers in individual or team prep. 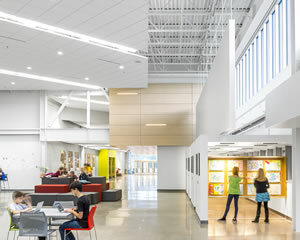 The commons is both an extension of the media center and the art studio, providing gallery space and a physical manifestation of arts integration into everything the school does. The roof was raised 15 feet in this section of the building, allowing natural light to fill the space. Flexible breakout spaces with a variety of formal and casual furniture allow for more self-directed learning by students. These spaces can be used individually for small group work or be combined for larger scale projects. The District proactively sought student input on the furniture selection. Students tested several options of furniture and provided feedback via Google docs and one-on-one conversations. The design also facilitates improved site circulation by creating separate car drop-off and bus loop pathways, increasing safety for both pedestrians and riders. A new double door entry creates a vestibule with locked inner doors once the students have arrived. During the school day visitors enter the office through the vestibule and receive passes to enter the building. The CERC features a separate public entrance and monitored, secure doorways are located between the CERC and the school itself for additional security. In addition to staff presence at both school entry points, video monitors provide another component of the school’s security system. With permission from the State and to accommodate the construction schedule, Jordan School District began and ended the school year early. Teachers moved out of their classrooms the day classes ended on June 5, and demolition began the next day. While school was in session, the District was able to vacate a portion of the building by moving the FACS program, Community Education and District Offices to the High School building. Some staff worked from carts with docking stations and the media center was moved to a very small temporary space. Construction was phased so major renovation work was carried out over the summer months, allowing the school to remain open and operational during the school year. Prior to the start of the 2015-16 school year, DLR Group engaged teachers in a Learning Space Activation process. In a series of workshop-like discussions, DLR Group design team members demonstrated several spatial opportunities supported by flexible spaces throughout the school. 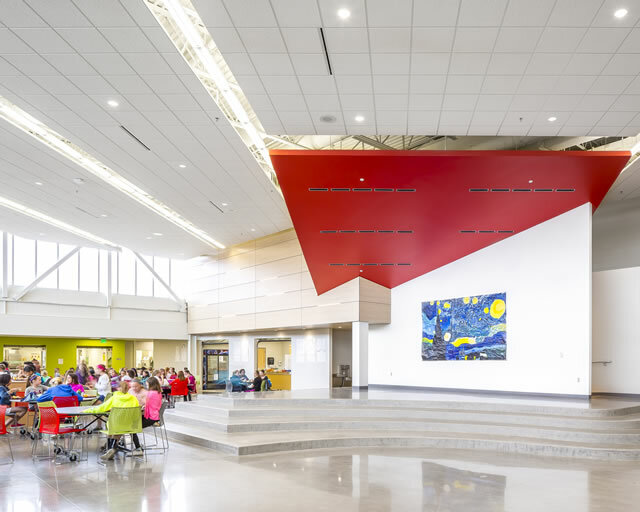 Together, stakeholders continue learning how to leverage the building’s flexible character and better use the dynamic, seamless canvas that it offers. In the end, DLR Group’s design transformed an outdated, 50-year-old facility that had isolated students inside classrooms into a modern, flexible environment that encourages interaction, collaboration and hands-on activities. Not only does the school accommodate more students, it allows them to learn in new ways. By using the entire building as a learning environment, Jordan Public Schools is changing the way the middle school program is being delivered.